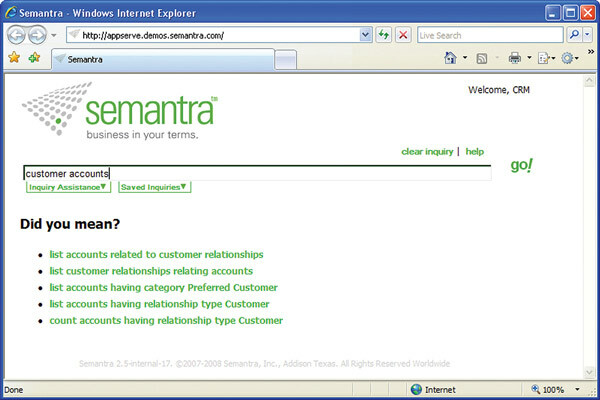 Semantra Inc., which aims to make the data in Microsoft Dynamics CRM easier for non-technical business users to search and analyze, released Semantra 2.5 for Microsoft Dynamics CRM last month. Despite its dot-release number, the version is jokingly described by the Addison, Texas-based company's CEO Chris Davis as the "check-writing" release. In other words, it's the first version to go beyond major test implementations, or interested systems integrators and VARs, to actually reach potential paying customers. The 5-year-old, private equity-backed firm has spent part of the time since its inception finding the right market for its technology. The business intelligence technology allows users to enter common business terms into a simple search box. Semantra requests clarification from the user on vague terms, then translates the natural language request into a SQL query to pull data from databases. Initially, company founders thought the natural language search capabilities might find a place in the consumer world. Semantra helps business users convert natural language phrases or questions into sophisticated queries of available data in the Microsoft Dynamics CRM system. "When I joined, I turned our sights on the enterprise," Davis says. "Candidly, I think in the consumer world, Google is good enough, Microsoft Live is good enough. But on the enterprise side, we saw a major gap in terms of enterprise analytics for the typical business user." Asked about Semantra's value proposition for Microsoft partners, Davis says, "I think we're helping the Microsoft VARs look smarter. And at the user level, it's all about usability, which really dovetails with the Microsoft strategy." By making the data inside Microsoft CRM more accessible to more users, Davis says, "I can turn a 25-seat deal into a 100-seat deal." New features in the 2.5 release include services and marketing modules, summary analytics, enhanced integration with Dynamics CRM, including linking results back to Dynamics CRM and dynamically adjusted result sets. "Probably the most exciting piece that we've added is that now we can link out to public data," says Cody Aufricht, vice president of marketing at Semantra. "If you want to launch a group of e-mails based on an e-mail column, you can do that. You can make a map. It extends the application beyond what's in your database." The underlying technology can also be integrated with Oracle and SAP, although Microsoft is the major ISV partner at this point. Davis says Semantra has plans to optimize for other Microsoft Dynamics applications in the next year, and possibly Microsoft Office SharePoint later. Some high-profile Microsoft partners see the technology as an opportunity. Semantra launched a partner program in September that already includes Tectura Corp., ePartners Inc., Hitachi Consulting Corp., Quest Software Inc., First Tech Direct LLC and I.B.I.S. Inc. Semantra is looking to eventually have about 20 partner relationships with Microsoft national systems integrators and leading regional VARs. "We are 100 percent focused on channel sales," says Aufricht. "Even though we'll do some of our own demand creation, we will introduce a partner into any deals we take down."